Since I started crocheting and then knitting, I’ve completed five sweaters. The first sweater was too big (no photos taken), the second sweater was too small. Then I learned how to create a swatch and test my gauge. The tricky thing with knitting clothes, that need to be a certain size, is that there are three factors that can greatly change the size of a stitch. The first is the size of the strand of yarn. Yarn comes in “standard” sizes the same way that women’s clothes do, which is to say, broad estimates of size, but a huge range within each estimate. The second factor is the size of the needle. Needle sizes are more standard than yarn sizes, but different needle lines will vary. Finally, and most varied, is the tension of the yarn. Tension is solely determined by the individual knitter. 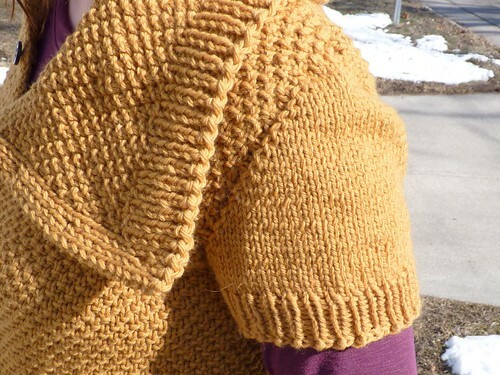 The more you knit, the more you learn what type of knitter you are from loose to tight. Also, depending on your mood, the time of day and where you are knitting, your own tension can change. With these three factors, it is amazing that it is even possible to make something in a certain size. When someone designs a knitting pattern they are using a specific yarn, a specific needle and they themselves are holding the yarn at their own tension. Knitting a test swatch helps to determine if the instructions in the knitting pattern will match-up with the knitting size you are creating. I still don’t really like to swatch, but swatching is the reason I’ve had sweater success. I finished my first, well fitting sweater about a year ago, just in time for our trip to Europe. Here I am wearing it in Paris. 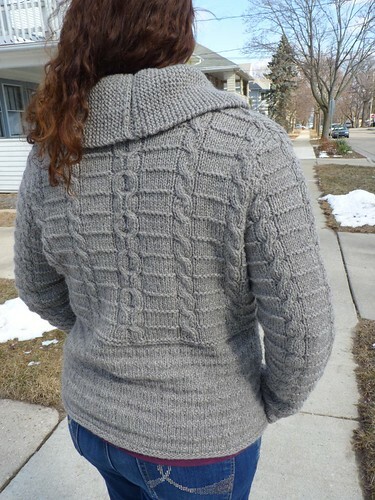 The yarn came from a local yarn producer and the sweater has a hood. This fall I finished my second, well fitting sweater. This time I used more mass produced yarn. 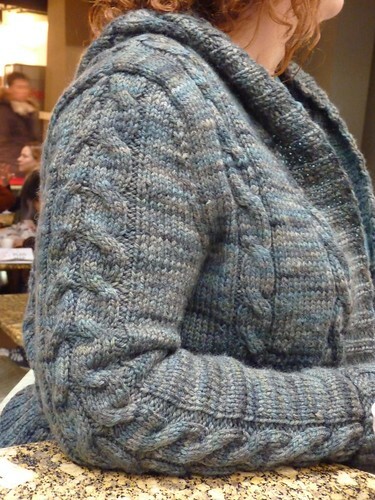 It has a large collar and fun textured knit work. Finally, I recently completed the more modern sweater pictured at the top of the post. This pattern reminds me of something you could buy at H&M, only nicer. The buttons run at a diagonal and it has a massive collar. Again, I used a more mass produced yarn. Now I feel like I’m on a sweater roll. Next up I’m working on a summer weight sweater to wear with summer dresses. Ah summer dresses. I can’t wait! After last year’s epic blanket challenge, where I knit eight gift blankets, I decided it was time to focus my knitting and crafting on me. While I’ve been busy knitting away, I haven’t been keeping up with sharing my finished wares. This post is a bit of a recap of finished projects from this fall and winter. My first two projects are pictured above. The chunky cowl is a mobius strip, which means it forms a complete circle, but with a twist, so if you follow the outer edge you circumvent both sides before returning to your starting spot. To knit, you work from the center outwards. The whole time I knit I was continually amazed by the geometry of the shape. The yarn came from a single sheep, Jeffery, who has started to go a little grey as he’s aged. I wasn’t sure how often I would use a cowl, but so far it has added extra warmth on cold winter days in my office. The cable hat was also made from locally produced and dyed yarn. 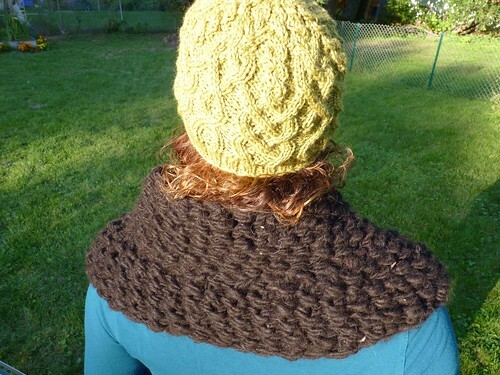 Both the cowl and hat yarn were purchased at the Jefferson Sheep and Wool festival in the fall. I love the color of this hat and it has been my go-to hat since finishing it. 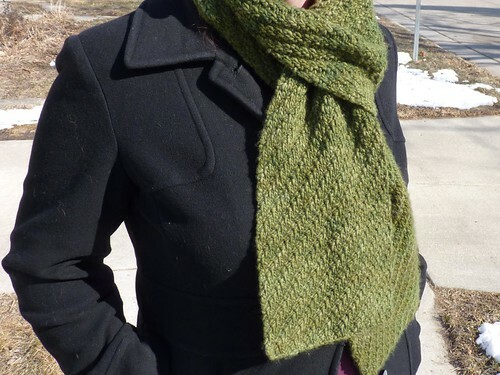 To complement the hat I needed a new scarf and found this olive green yarn on-line. The yarn is super soft and the scarf finished at a nice length. In addition to the mobius chunky cowl, my work days are warmer now that I have my first pair of fingerless gloves. 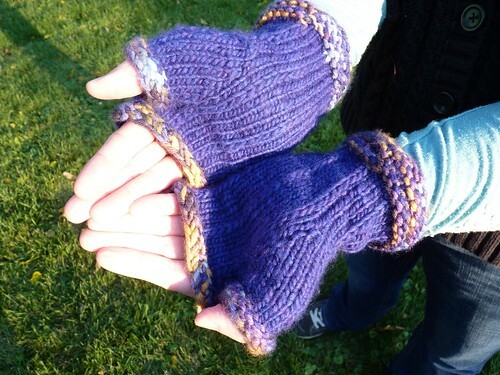 These gloves are made from left-over yarn and really do take out the chill. I also finished a couple larger projects, but I think they deserve their own post. Recently I was reminded of this project that had been lingering in my thoughts for a long-time. I wanted one of those cool, modern, plant centerpieces, made up of succulents and cactus, where the plants were kind of tumbling out of the pot. The recent inspiration came from my sister, who took some amazing photos at a San Francisco garden center, Flora Grubb. Looking at their site, not only do they have the centerpiece inspiration, they are also showcasing glass globes filled with air plants. This store looks like my kind of place! Right after the injection of inspiration, I visited Olbrich Gardens, here in Madison. They too were featuring these succulent centerpieces and in their little garden shop, they were selling some very cool succulents. SB bought me a couple and then with a little searching I found a nice pot and a few more plants to fill-out they arrangement. I didn’t want to fill it too full to start, so that each plant would have some space to expand. The only thing that may be missing is a couple of carefully placed stones. With the Sunshine Throw, I officially close the 2011 Blanket Challenge. 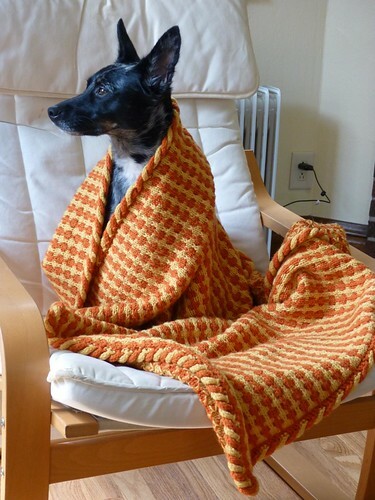 This blanket, so nicely modeled by Lola, is blanket number eight and is a beauty. There are two geeky knitting things that make the sunshine throw special. First, it uses a slip stitch technique to work two colors at once, creating the illusion of the decreasing and increasing vertical lines. 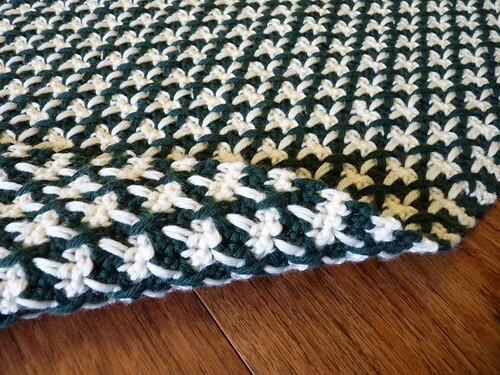 Second, it has a two strand i-cord border that gives the edge a nice bulkiness and texture. Everything about this pattern came together perfectly. I couldn’t be happier with the end result and am excited to give it to a knitting friend/new mom. As for the timing on finishing this blanket, it just makes me sad. I had planned for this blanket to take me a month, which would have meant that I met my goal of eight blankets in six months. Instead, life, work, the house and summer got in the way and it took me two months to finish. At the five month mark I had completed seven blankets and had just one to go. Success seemed like a sure thing. Oh well, I don’t regret any of the non-knitting things I did. All told, in seven months I completed eight blankets, which is still more than one a month. Here is one of the happy recipients. He says this is the best blanket he’s ever had. The first day with the blanket he was already picking out a name for it. Last I heard the blanket was “Blue McQueen”. Sweet number seven, the Fleur de lis Throw. The crocheted stitch pattern of this blanket made a thick, but not stiff fabric. It will be a wonderful winter weight couch warmer. I really like the lattice pattern and how your eye creates the fleur de lis shape out of the crosses. The only thing I would change, if I made it again, would be to make a slightly narrower and longer version. The edge on this blanket is so clean, no additional border was needed. No complaints there!